Last year I didn’t go out with the handcycle enough. It was uncomfortable. It was hard to get on. It was hard to get off. It was hard to keep going. I couldn’t figure out how and when to shift. The brake cable was in the way. It had the turning radius of a garbage scow. And then there were the logistics. Where do I carry my keys? How can I attach a safety flag? What if I need to go to the bathroom? What if I get a flat? This year, it’s all different. It still has the turning radius of a garbage scow, but everything else is easier (well, I’m still really bad at shifting, too). Think it has something to do with 10 months of weight lifting? And the logistics have to be solvable, and who better to help me solve them than other handcyclists? I’m going on a group ride next weekend sponsored by the City of Boulder‘s Parks & Recreation EXPAND program. I’m also looking into getting some information, instruction and support from the Adaptive Sports Center in Crested Butte this summer. And for the future? 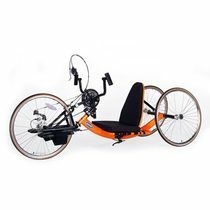 How about a handcycle tour? Hmm, I see a sly plot brewing, lol. Good for you. I’ve never tried a handbike before.